February | 2008 | Wong Family Inc. Since May started kindy, Aba has been encouraging her to make friends there. Taught her to say “My name is May, what’s yours?” in Mandarin, as an introduction. (May couldn’t speak Mandarin at all yet). 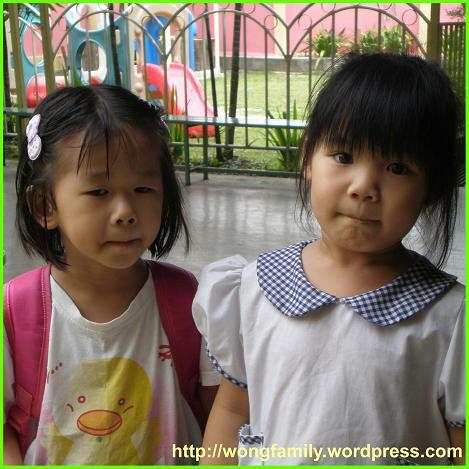 After a month, May overcame her shyness and made her 1st friend (previously, she only had play-buddies-of-convenience). Now, she has 4 friends. This entry was posted in The Kids on February 29, 2008 by wc9. Sarn: Sarn only eat carrots. Sarn: Because Sarn is a rabbit, like at May’s school. Ama: The rabbits there are in a cage. So you want to be caged? Sarn: … OK. Sarn will eat chicken and potatoes. Sarn NOT rabbit. This entry was posted in The Kids on February 26, 2008 by wc9.